I know this is a bit forward, but do you have any gluten-free recipes? my boyfriend’s mom can’t eat anything with wheat in it, and she has to watch her sugar and cholesterol intake, which makes preparing or buying food a big and expensive hassle for her, often requiring her to order recipes online, or cutting certain foods out of her diet altogether. Since you’re good at altering and modifying recipes, would you have any suggestions or recipes? i have told you before, but everything you do is amazing… you are so talented..do you usually taste everything you eat? or do you just take the compliments? i am lucky if i have enough left to share with everyone because it is all so delicious! all of your knitting and crocheting is amazing as well…really, you shoudl go on martha stewart!! Now we will never be hungry again or ooopsss… may be we will be hungry again & again…hee hee…May God Bless you…. I loooooove your blog! All your recipes really look very very very tasty and awesome! I’m going to bake some of your recipes. I made my first lemon pound cake from scratch for Thanksgiving, it was a total hit. My family is requesting that I make another for christmas. Your site is so wonderful. I have a daughter with extensive food allergies, and I felt like she was missing out on a lot of fun desserts until I discovered your site and your amazing recipes. Thanks! I learned this a couple of years ago from a local farmer—sweet potatoes are light-fleshed (yellow/white) and yams are orange. In the US the terms have become interchangeable but I’ve noticed at the local markets and farmer’s markets that they label orange tubers as ‘yams’ and the light fleshed ones a ‘sweet potatoes’ but in other places they are all ‘sweet potatoes’. There was something about the sugar content as well but I don’t remember which has the higher. The link to the homemade magic shell recipe seems to be broken. Does anyone have it? wow, xiaolu told me about your blog and your upcoming book! i am so excited to read about your breakthrough recipe for veganized french macarons!!! i’m sad i missed out on your booksignin in NYC, but perhaps i can find your book at a local bookstore here!! I am in the process of making your roast apricot with almond praline ice cream (it’s summer here in Australia!) and I have had a small issue with the praline. Never having caramelised sugar before, and since I used unrefined sugar it was already amber colour, I was unsure how much to reduce the water content. The upshot was, it set hard on the mat, it broke up intp pieces, I processed it but instead of paste I got powder! I added the oil and it more or less disappeared. Would you advise adding more oil, or more water to get the required runny peanut butter consistency for marbling into the ice cream? By the way, i’m definitely going to visit your site again – our vegan family are always on the lookout for yummy things! Thanks Hannah – am about to launch myself into yr Black gingerbread slices! The praline was just too stiff to ‘ripple’ in the ice cream so i just mixed it in – had to work it in really well or else there wd have been big lumps! – and it worked out pretty well!! and do visit my blog and give your feedback. It’s not much, but i’d love your comments and suggestions :) Thanks again. 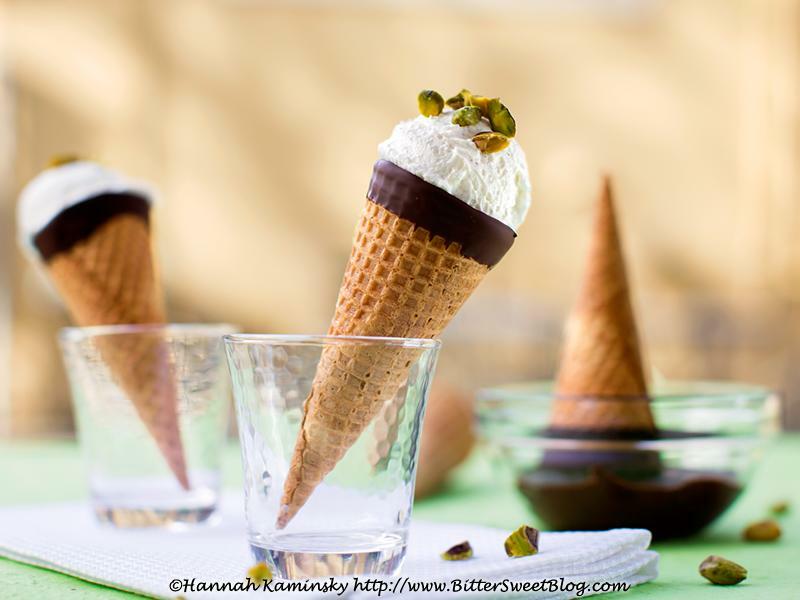 Hi Hannah, your recipes look incredible – I can’t wait to try a couple this week (I’ve got my eye on the Chocolate Candy Cups and the Banana Pumpkin Spice Muffins!). I was actually led to your blog by a google search for ‘mint chocolate vegan desserts’, which took me to the page for your cookbook with that amazing pic of your mint choc macarons – but I can’t seem to find that recipe in the index above. Is it a recipe available in your book only? Otherwise, if you can point me in the right direction, it would be greatly appreciated! What book is your macaron recipes in? looking for the birthday cake ice cream in vegan a l a mode. would like to get some feed back, curious about the texture of the cake in the ice cream. Are you on Instagram, I don’t see the icon. Afraid I’m not at the moment, but I’m working on getting started! I’ll update my information and share a link once my account is really up and running. Thanks for asking! his recipe looks absolutely delicious. Nice article and I love love this recipe and you entire blog is my favorite.